This children’s chapter book, aimed at ages 8 – 12 years, is an easy read at 96 pages and features beautiful full-page illustrations. It begins in 1859 in the voice of one of Abraham Lincoln’s sons, Willie, who has been allowed to travel with his father on a business trip to discuss Lincoln’s running for President of the United States. Later, it follows another son, Tad, when the family is ensconced in the White House. This book shows a side of Abraham Lincoln that you’ll not find in most biographies–viewed through the eyes of his beloved children, and includes the wisdom he imparted to them through the difficult years of the Civil War. I greatly enjoyed this intimate look at this highly documented president, and even learned a few things I hadn’t known. The author states that all events are true–one heart-rending scene shows the youngest child giving a food gift he’d received to a hungry little girl at a train station–and includes an Author’s Note with details. 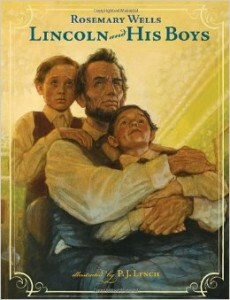 It is a very attractive book that would make a nice gift, or a handsome addition to a Lincoln collection.